Sizes included; #8, #10, #12, and #14. Lengths included; 1/2, 3/4, 1, 1 1/4, 1 1/2, 2 and 2 1/2 inches. Zinc coated. Flat head phillips drive. 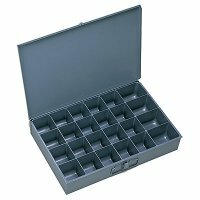 Comes with metal 24 hole storage compartment. 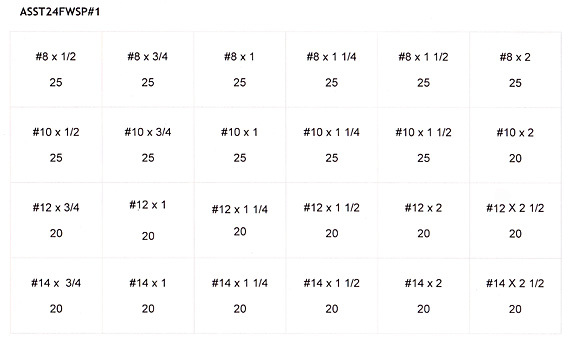 See chart below for detailed quantities, sizes and lengths. 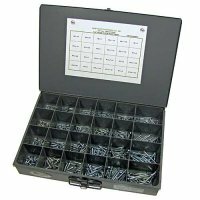 Specs on 24 drawer metal compartment box - 18 inch width, 3 inch height and 12 inch depth. Manufactured of prime cold rolled steel and finished in rust and acid resistant baked enamel. 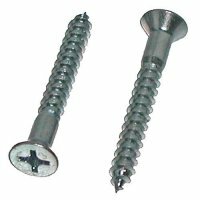 High impact plastic inserts with rounded scoops for easy removal of small parts. Items will not spill over to other compartments when the lid is closed.